Further to the recent post on the addition of DFS golf information to Golf Predictor, I am pleased to announce more new DraftKings analysis on the new Rankings (DFS) page. As can be seen in the first screenshot above, again for the 2015 US Open, the columns have been changed, including the addition of a second colour coded one. As a result, the colour code table has been updated to account for this. In addition, the average dollars per point for for the field has been added above the chart links. DFS columns for the average points per game (previously displayed on a pop-up) and the colour coded dollars per point have been added to the page. 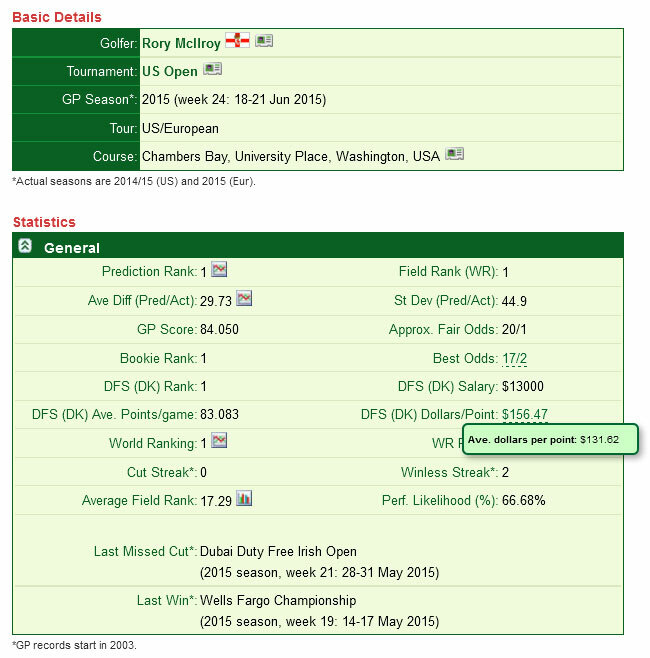 The latter is simply the golfer's DFS salary divided by his average points per game, i.e. the last column is equal to the third last column divided by the second last column. It is a measure of the golfer's value for money: golfers with a low value in this column are undervalued by DraftKings and those overvalued will have a high value. 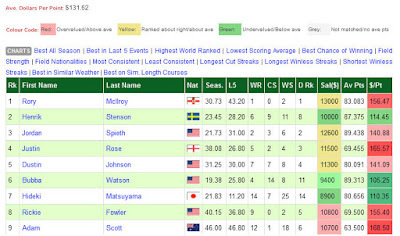 This column has been colour coded by comparing each golfer's value with the field average (shown on a label on the top of screenshot one above). If a golfer's value is in green, he is undervalued, while if he is overvalued it will be in red. The more under/over valued the golfer, the deeper the colour. Golfers around the average field value are coloured yellow/gold. Note that the weather and similar length course columns have been removed to make way for these new DraftKings columns. They are still available on the Predictions (Odds) page, if needed. For tournaments with this new DFS information, a second new row has been added with the same information to the General panel on the 'Prediction Data' page for each golfer. This is shown in the second screenshot above, again for Rory McIlroy for the 2015 US Open. On this page, the average points per game is now shown directly (previously displayed on a pop-up) along with the new dollars per point. The pop-up box has been moved to this new field and it displays the field average for this metric for comparison purposes. This makes the new premium DFS Golf features even more useful. Any feedback (via comments on this article or email) would be most welcome. Like other premium features, non-subscribers can only see this new DFS golf analysis for golfers ranked 11-25 in the prediction rankings. Therefore, sign up today and reap the full benefits of Golf Predictor, the premium professional golf statistics site.